Gung Haggis Fat Choy is the annual celebration of Chinese New Year mixed with Robbie Burns Day that epitomizes the sense of community and collaborative spirit that thrives in Vancouver. The event has been postponed this year so be sure to make note of the new date! Celebrating BC Scottish and Chinese pioneer culture, history through music, poetry and culinary fusion, Gung Haggis Fat Choy will take place Sunday, March 16, 2014 starting at 5:00pm at Floata Restaurant (180 Keefer St). The new date is St. Patrick’s Day Weekend so the event will be inclusive of Irish, Chinese, Scottish and First Nations cultures for a reinvigorated Gung Haggis Fat Choy that will celebrate our province’s pioneer history and the cultural fusion of today’s diversity. Single tickets are $65 and group tickets are $650 for a table of 10. Each ticket includes a service charge. Purchase online in advance. 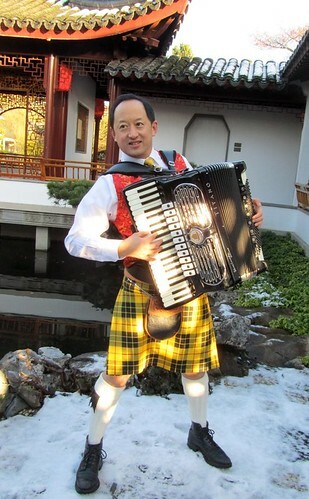 Founded by Toddish McWong (Todd Wong) in 1998, Gung Haggis Fat Choy events have sprouted up across the Pacific Northwest and on Vancouver Island. In 2005, the dinner moved to the largest Chinese Restaurant in North America at the time (Floata) and has since been attended by Mayors, MLAs, and celebrities. Menu highlights previous years have included deep-fried haggis wonton and haggis pork dumpling (su-mei) along with appetizer courses. “Neeps” served Chinese style in the form of pan-fried turnip cake, dim sum style. Traditional haggis is served with Chinese lettuce wrap. Toss in poetry, music, and sing-along tunes like My Chow Mein (Bonny) Lies Over the Ocean and When Asian Eyes Are Smiling and you’ve got yourself a party. For more information follow Ricepaper Magazine on Twitter and Facebook and be sure to mark your calendars for St. Patrick’s Day weekend.